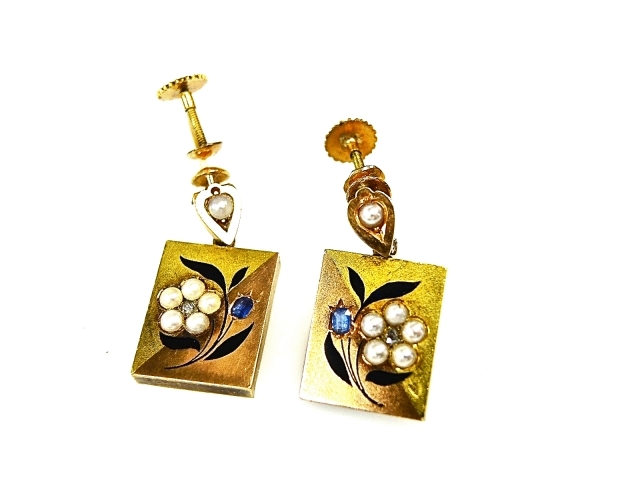 Edwardian 18kt yellow and rose gold earrings with 2 bead-set rose cut diamonds, est. 0.03ct. (clarity: SI-I1 & colour: H-I); 2 bead-set oval facetted cut blue sapphires, est. 0.12ct (clarity: LI & colour: medium powdery blue); 12 creamy with silvery grey overtone seed pearls approx. 2.5-2.8mm and accented with black enamel floral leaves.